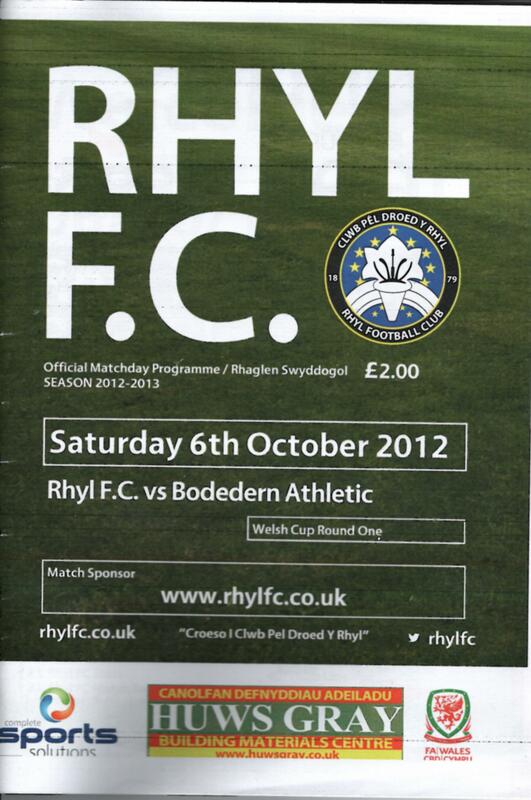 Rhyl have a very rich history and are one of the most successful of the Welsh clubs who don’t play in England. They go back to 1879, have played in various Welsh and English leagues and have played in the English FA Cup a number of times, getting to the fourth round in 1957, losing 3-0 to Bristol City. In the early years they played in various Welsh leagues including the North Wales Coast and a Anglo-Welsh competition known as the Combination. They applied to the English league in 1929, but were passed over in preference of York City. They then went on the play in other English leagues – the Birmingham and District and the Cheshire County. In the eighties they played in the North West Counties League and then the Northern Premier, but reluctantly joined the League of Wales in 1992. However, their time spent pondering cost them a place as their application was too late for the Welsh top flight, so they started in the Cymru Alliance, but won promotion at the first attempt. They are the only Welsh non-league side to retain the Welsh Cup and recently have enjoyed some spells in Europe, after winning the Welsh Premier twice and finishing in the top three on a number of occasions. Their best perfomance was an aggregate win over FC Atlantas from Lithuania, on the away goals rule, after winning 2-1 at home and losing 3-2 away. 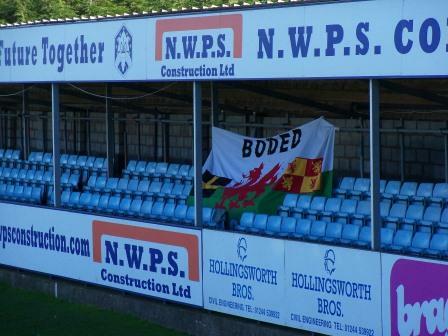 Despite being Welsh Premier title contenders in recent years, in 2010 their licence was revoked; the big fish was demoted to the small pond known as the Cymru Alliance. Their first two seasons saw them finish second behind GAP Connah’s Quay but now Connah’s Quay have been promoted (after sorting their own licence out), the path is clear for promotion and judging by their start to the season is going to be accomplished with ease. 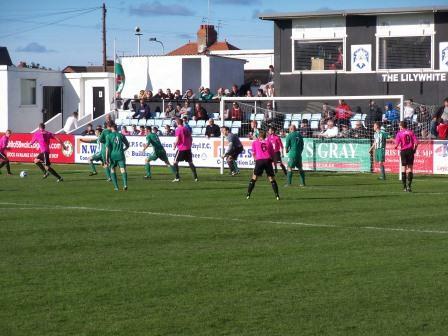 Rhyl’s Belle Vue ground is one of the finest and biggest of the Welsh leagues, having been their home ground since 1892. It looks a bit out of place in the Cymru Alliance, where their competitors such as Penycae, Llanrhaeadr and Ruthin have little more then railed off pitches, with no floodlights. 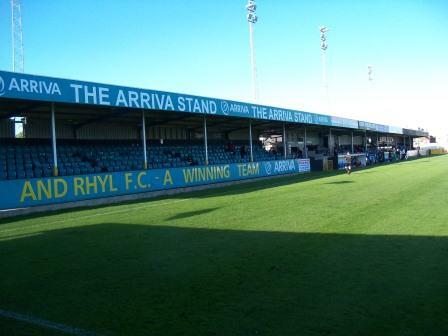 Rhyl’s ground could easily grace the Conference. For Bodedern Athletic this was their game of the season. They were only a division down from Rhyl, playing in the Lock Stock Welsh Alliance, but in terms of facilities and playing standard the gap would seem much wider. For Bodedern to come away with anything but a loss would be a shock as big as an English non league team beating Premier league opposition. The Belle Vue has structures on all sides seating 1,720 with a capacity of 3,000. As you come in there is a portacabin that has been deposited on an old terrace, called the Lilywhites lounge, with seating in front. I thought this was a shame as behind the portacabin you can see that this once was a really fine terrace with a good vantage point. They already have enough seats and surely this lounge could’ve been dropped elsewhere in the ground. That’s the only criticism I’d have, that there’s nowhere in the ground to get much height. The NWPS stand lines the bottom end with rows of seats. The George Janes stand and TV gantry span about 2/3 of one side with the Arriva and Don Spendlove stands adorning the other side, where the players tunnel is. Rhyl were playing in a bespoke pink home kit, to raise money for breast cancer. Bodedern had brought a handful of supporters and positioned their attractive flag behind the goal they were kicking into in the first half. They didn’t have much to cheer about, however, as the expected drubbing materialised with brutal predictability. They cantered to a 4-0 half time lead, and when they netted they seventh before the hour I got very excited at the prospect of witnessing my first double figures game. Alas, and yet again this season the goal tap was switched off firmly and unexpectedly as Boded managed to stem the tide of goals and have a go at getting a consolation. Doubly annoying for me was that a few weeks later Rhyl DID manage double figures in the league, winning 11-1 against Llanrhaeadr. The Belle Vue was a quality ground that will rightly be playing top tier Welsh football next year, barring a catastophe. I expect they will be up their amongst the front runners too. While they’ve been slumming it among the Alliance it is a good crowd puller for some of the poorer supported clubs as Rhyl take a sizable away following, so they will be missed. 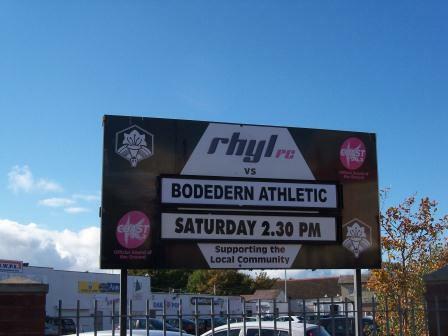 This entry was posted in Travelog and tagged belle vue ground, Bodedern Athletic, Rhyl, Rhyl FC, Welsh Cup, Welsh Premier. Bookmark the permalink. 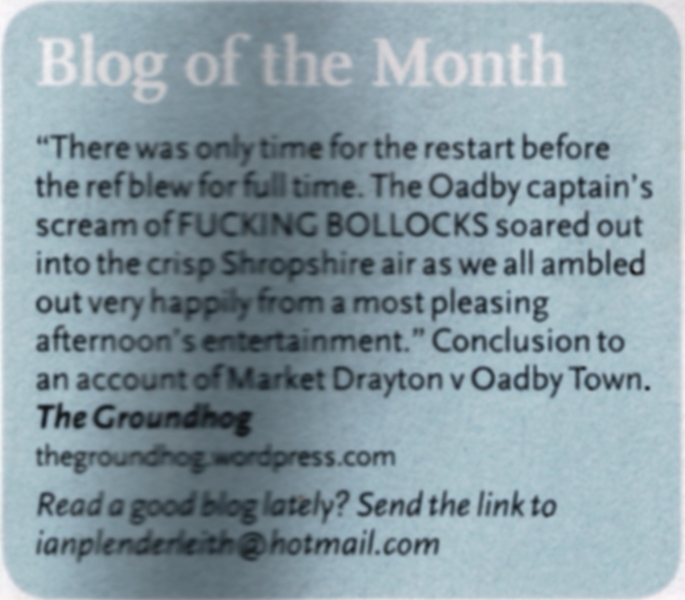 a most enjoyable read , thank you.Thanks for adding another ground to tick !